Buy Panda Natural Original Liquorice (Licorice) - 4 bars in the UK from our online shop or directly from our independent Scottish store. Panda licorice (liquorice) is made using only 4 ingredients to give the very best natural licorice! Panda Original Licorice 4 bars is free from additives, preservatives, animal ingredients. Molasses syrup, wheat flour, liquorice extract, natural flavouring (aniseed oil). We sell real Panda and other Licorice directly from our shop in Scotland and online throughout the UK. View more products from Panda. Where can you buy real Panda Licorice 4 Pack safely online? If you are wondering where you can buy Panda Natural Original Liquorice (Licorice) - 4 bars safely online in the UK, then shop with us. We are an actual health foods shop; with real people selling real foods and products. Our award-winning independent shop is located in Stirling, Scotland since 1976. You can buy our Licorice in store or safely place an order with us online or over the phone. 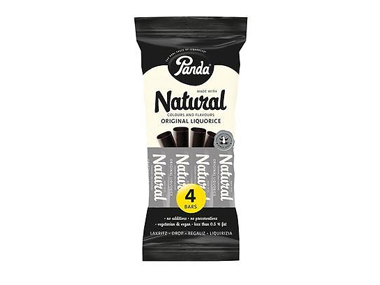 Panda Licorice 4 Pack - Panda Natural Original Liquorice (Licorice) - 4 bars in Licorice and Confectionery.